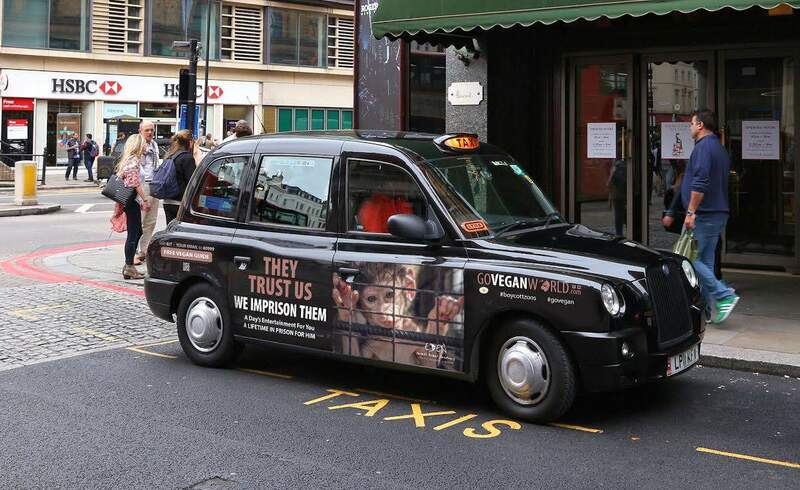 Go Vegan World has accused the National Farmers’ Union of “entirely missing the point” in its recent criticism of the campaign which has been appearing across the UK and Ireland on billboards, taxis, motorways and at underground stations as well as full page adverts in national newspapers. The campaign features powerful, highly thought-provoking messages such as Dairy Takes Babies from their Mothers, Humane Milk is a Myth: Don’t Buy It and Vegetarianism is Not Enough for male chicks who are killed at birth by the egg industry. The award-winning advertising campaign is designed to encourage people to question the notion that humans are better than other animals; and to get them to think seriously about the ethics of continuing to use animals as food, clothing, entertainment, and for research. On 5th February, the Sunday Telegraph ran a full page Go Vegan World advertisement featuring one of the campaign’s ‘Dairy Takes Babies from their Mothers’ slogans. However, Michael Oakes of the National Farmers’ Union (NFU) dairy board responded to the advertisement, by writing an open letter criticising the GVW campaign, calling it ‘misleading’ and claiming standards of animal welfare in dairy production were high. The Go Vegan World campaign, however, is not trying to mislead anyone. Rather, the adverts portray an accurate picture of the dairy industry, substantiated by evidence which can be researched thoroughly on the Go Vegan World website. GVW Campaign Director – and Founder of the Eden Farmed Animal Sanctuary – Sandra Higgins said: “For the NFU to defend the dairy industry by referring to animal welfare and benign treatment entirely misses the point of the campaign. “There is no need for farmers to feel threatened or disheartened about veganism. We will need and value farmers more than ever in a vegan world. “Farmers can rest assured that there will be no more vocal and effective a voice in ensuring that they receive all necessary support to transition to alternative, more ethical and sustainable ways of making a living, than that of the vegan community. Sandra is passionate that the general public has a right to know the facts involved in dairy production, including those farms that carry a Red Tractor quality assured label. These labels are part of the myth of humane farming that the campaign aims to highlight. She points out that most people are not aware of the exploitation of the female reproductive system and the slaughter on which dairy is predicated. 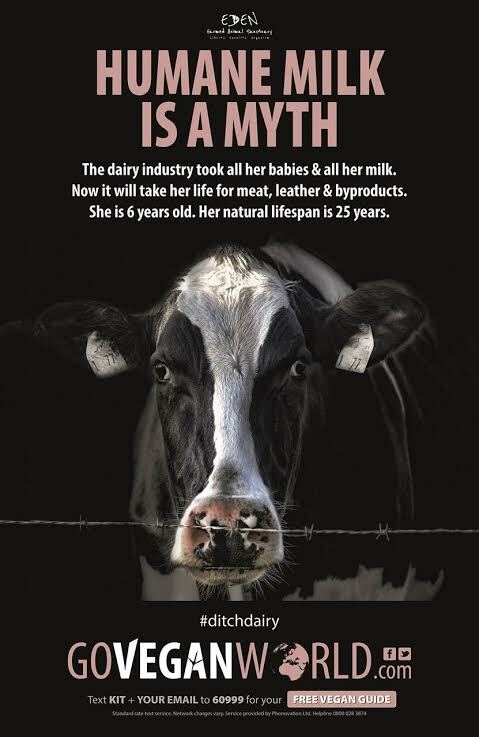 The GVW campaign seeks to dispel the myth that dairy is essential for human health, a myth that the dairy industry has promoted as fact for decades. In fact, studies have demonstrated that consumption of dairy increases the risk of bone fracture, breast and prostate cancer, as well as obesity, cardio-vascular disease and diabetes. There is a growing body of research that shows that a switch to a vegan lifestyle would actually benefit the environment, human health and help alleviate world hunger. The Go Vegan World Free Vegan Guide can be downloaded click here. The dairy industry can’t and shouldn’t fight factual evidence. Facts are facts nd it’s time to target schools so that our next generation aren’t brought up on lies.